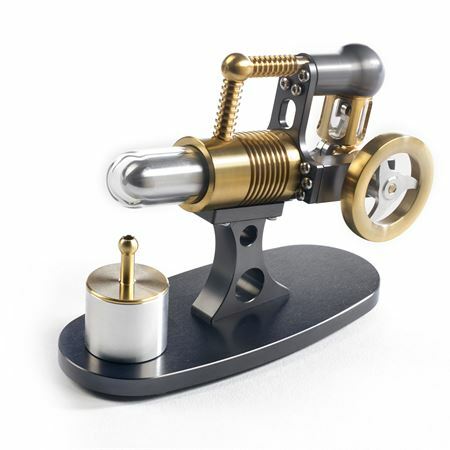 This was conceived as a ‘nano’ version of our popular KG09 Stirling engine. The engine has the usual displacer and power piston arrangement, but the two pistons are placed further apart using a tube. Placing the power piston at 90 degrees to the displacer piston, allows the two con-rods to share a common crank pin. Which simplifies the crank design. Overall this engine is compact, blisteringly fast with curious tube arrangement. 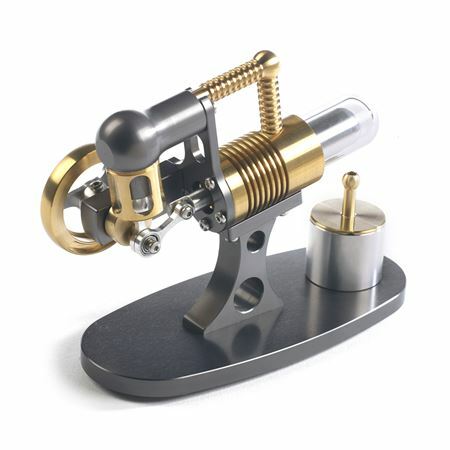 As with all the nano range it comes with a special burner, you just light the burner, let the engine heat up and then give the flywheel a small flick to start. The engine has borosilicate glass cylinders which can withstand high temperatures enabling you to glimpse inside the engine. A low-friction graphite piston was utilised which is self-lubricating and requires no maintenance. A brass heat sink disperses heat from the cold side, while the rest of the engine is made from anodized aluminium.